About Emilia G. Message Emilia G.
Emilia was very patient in answering my questions before the tour was booked to make sure that it was right for me and was able to plan the tour on short notice. The tour itself was wonderful and she is a very knowledgeable guide. If you are looking to see as much of Cinque Terre as you can in one day, I would highly recommend this tour with Emilia. TOUR GUIDE RESPONSE: Dear Angela, it was a great day for me too. Immediately I felt like I was on tour with a friend. Thank you so much! We spent a delightful day with Emilia in Cinqueterra. She is warm, knowledgeable and fun to be with. All six of us loved her. TOUR GUIDE RESPONSE: Dear Delorm family, I thank you for choosing me, it was a great day with you! This was a fantastic tour with an awesome guide. Emilia was vibrant and engaging, and easy to communicate with. She had our schedule sorted in advance, and despite it being an incredibly hot day, her energy level did not drop. We thoroughly enjoyed our time with Emilia, who had excellent knowledge of the area. Emilia was a perfect host for our Cinque Terre adventure. She was timely with responses prior to meeting, met us at the agreed-upon location, guided us to the ferry that took us to Portovenere and onto Monterosso al Mare. We explored Portovenere a bit and visited the St Peter church at the top of the hill and then took a nice relaxing and visually stunning ride to Monterosso. We had a lovely lunch. Emilia catered to our needs and was agreeable to all requests. We highly recommend her. Emilia was a wonderful guide . If returning to Florence/Cinque Terre and needed a guide, she is my first choice. TOUR GUIDE RESPONSE: Thank you Mr Fistner! Wow! Only Emilia could have done justice to the gorgeous Cinque Terre villages. She knew all the best photo spots, took us through back alleys to show us how the people in the village really live, and had many stories to tell about the history and beauty of the villages. Emilia planned our trip perfectly and we got to see all 5 villages by train and boat. She is a fantastic guide, and I would recommend her highly to anyone wanting to visit this wonderful region. Emilia very knowledgeable and helpful in guiding us through Porto Venere and the villages of Cinque Terre, and then back to La Spezia. Her value was in the local knowledge, and also in who to spend our time among the five villages (she focused on three, plus of course Porto Venere which was a highlight - don't miss it!) and also where to eat. Fantastic lunch! She also knew which local shops to pop into for fantastic focacia and also pesto. A great day! Six hours or so spent in the engaging company of Emilia was time well spent. 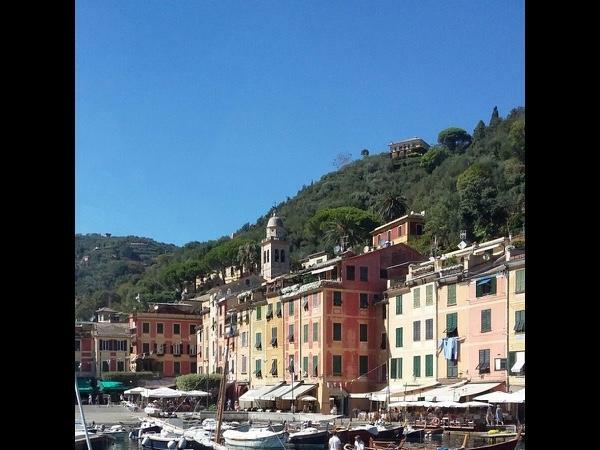 We learned much about Cinque Terre and life in Italy in general. An absolutely amazing day! The best Italian Cuisine and best stuffed Mussels I've ever had prepared by the coolest Grandmas!! Emilia was amazing! She had great knowledge of the area and took us to some great foodie locations, as well as, setting up a great cooking special request! TOUR GUIDE RESPONSE: Thank you Ron! Was an amazing day! Emilia is a great guide. We had a wonderful day together. She knows the area, is passionate about the area. She was informative and pleasant to be with. I would highly recommend her services, without reservation. It is a great way to cover all of Cinque Terre in just 1 full day. We really enjoyed our day out with her and she was very bubbly and was good company. She showed us around and gave us explanation history and background of each place she took us to. The guide Emilia: Fantastic, friendly, effective, shortest connection to locals. We enjoyed a lot the tour. Do not miss it. TOUR GUIDE RESPONSE: Grazie Mikhail, I' am happy to hear that, despite the hot clima, that it was a great day for me too. Ciao! Great tour, loved learning all the history of the towns. Emilia is very knowledgeable about the the towns, the people and culture to give a great tour. She is very thoughtful to ensure you have the best tour possible. TOUR GUIDE RESPONSE: Thank you Ms Ober, it was a pleasure for me to guide you. Emilia was very good. She provided w/great info regarding the area, history and people of each village we visited. She was quite inciteful about each village and answered all of our questions. We enjoyed the tour and her company. TOUR GUIDE RESPONSE: Dear Mr Ramshaw, Thank you for your rate, it was a pleasure and an honour to guide you among the beauty of my country. Sincerely yours Emilia G.
TOUR GUIDE RESPONSE: Thank you, it was great being with you!